Pelican Product: 1565549902, WHAT DO WE WANT TO BE WHEN WE GROW UP? Do you remember what you dreamed of becoming when you were a child? Did that change as you grew older, or did other parts of your life cause you to do something else while dreaming the same dream? Are you ready to find a way back to your dreams, or to find what you haven’t even dared to dream? 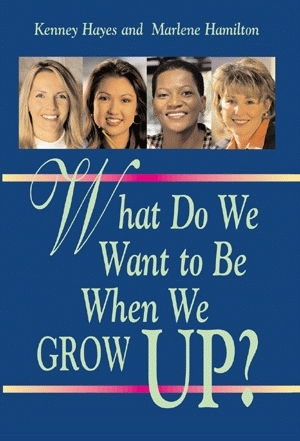 What Do We Want To Be When We Grow Up? offers, in a conversational format, the views of women who have found the path to their dreams, and whose path has lead them to help others do the same. Kenney Hayes gives advice from the perspective of working for over thirty years as a banking executive, and knowing the challenges that women face in their professional lives. Utilizing her life-long experience in women’s ministry organizations to encourage women to seek those things about which they are passionate, Marlene Hamilton’s approach focuses on the spirit. By collaborating back-to-back, each encounter creates a dynamic diversity of experience intimately familiar with a woman’s heart, mind, and soul. Women are challenged to think and take action through the personal-enhancement pages at the end of each chapter, which also give opportunities to internalize, strategize, and realize. Gain insight to your secret dreams and discover why many of them are still secret. Discover why frustrations occur in your life, and what they can teach you. Get in touch with your "inner woman", and find out how to motivate her. Change your life with belief, conviction, and passion! Kenney Hayes and Marlene Hamilton are “Women Who Win” and present seminars to groups (and not just women’s groups!) across the country and internationally. Both live in Gig Harbor, Washington with their husbands, children, grandchildren, and “twin” Yorkshire terriers.